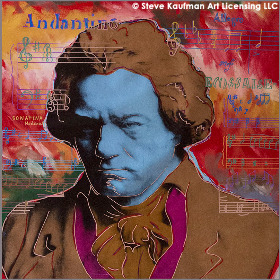 March 4, 2017 / Long Beach, NY – American Pop Art, Inc. and Steve Kaufman Art Licensing LLC are delighted to announce that “Beethoven Blue,” a tribute painting of the famous composer created by American pop artist Steve Kaufman (SAK) will be unveiled on Friday, March 17, 2017 at Beethoven-Haus Bonn, the birthplace and museum of Ludwig van Beethoven in Germany, where it will remain on permanent display. 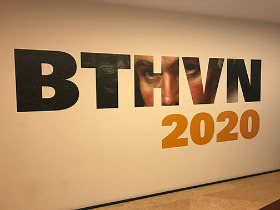 The honorary painting “Beethoven Blue” is a hand-painted oil on canvas silkscreen created in 1996 by pop artist Steve Kaufman as a tribute to the musical genius and historical icon. The striking 36 by 36-inch portrait with brilliant hues and accent notes from the composer’s musical compositions was gifted by Diana Vachier of Long Beach, NY, who worked alongside the late Steve Kaufman, former assistant to Andy Warhol. 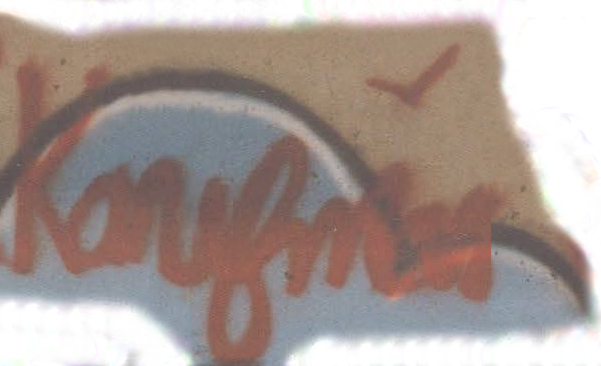 It was Warhol who gave Bronx-born Steve Kaufman the nickname “SAK,” using his initials. 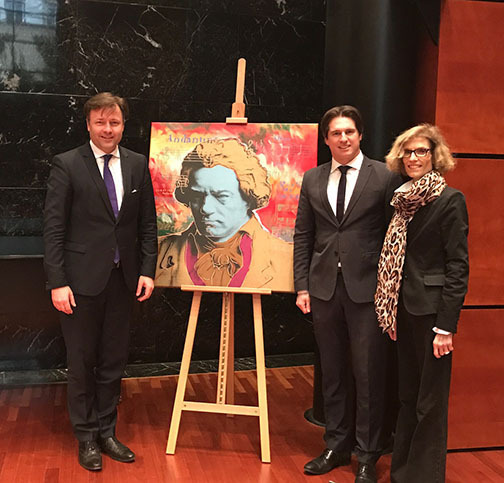 The painting’s March 17 dedication ceremony at Beethoven-Haus Bonn will highlight an evening of celebration and performances by visiting musicians-in-residence Jisun Lee (violin), Michael Romans (violin), Ursula Steele (viola), and Joanne Choi (violoncello) of Indiana University’s Jacobs School of Music. “Beethoven Blue” will be presented by Silke Rau and Alberto Panizzoli of Steve Kaufman Art Licensing LLC. Festivities will begin at 7:30 PM, and admission is free. 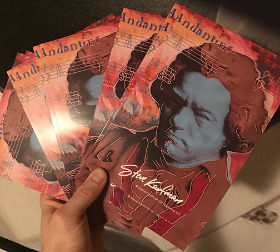 “Beethoven Blue” is the latest in a series of recent historical museum placements by New York-based American Pop Art, Inc. and Steve Kaufman Art Licensing LLC: In July 2014, Steve Kaufman’s “Mozart State II” was added to the permanent collection at Internationale Stiftung Mozarteum, the official Mozart museum and residence in Salzburg, Austria. 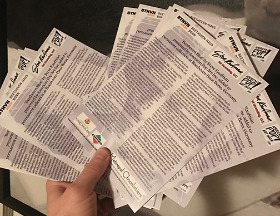 In April 2016, Steve Kaufman’s “Shakespeare State II” was added to the permanent collection at the birthplace of William Shakespeare at Stratford-upon-Avon in Warwickshire, England. Beethoven-Haus Bonn is located at Bonngasse 24-26, 53111 Bonn, Germany. 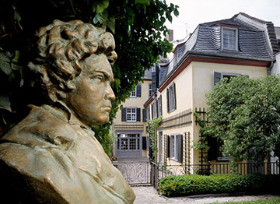 For more information, visit http://www.beethoven-haus-bonn.de/sixcms/detail.php?template=portal_en. 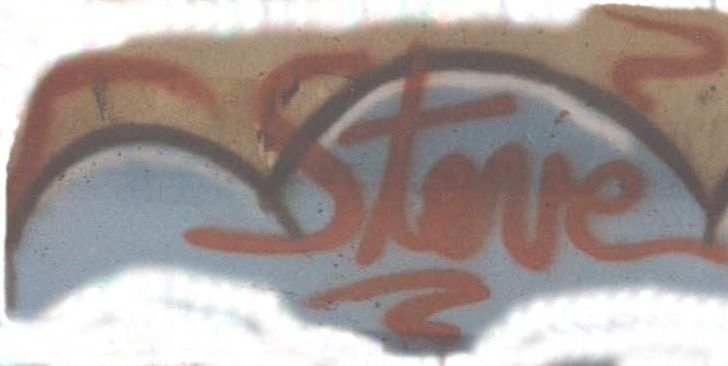 For more information about pop artist Steve Kaufman (SAK), please call 516-509-4676 or visit http://www.AmericanPopArtInc.com/steve-kaufman.htm.